We had such an amazing response to our Enneagram infographics that we decided to explore the personality theory even further. To give you further insight into types 1 to 9 and help you identify these personality types in your own life, we decided to delve into pop culture. 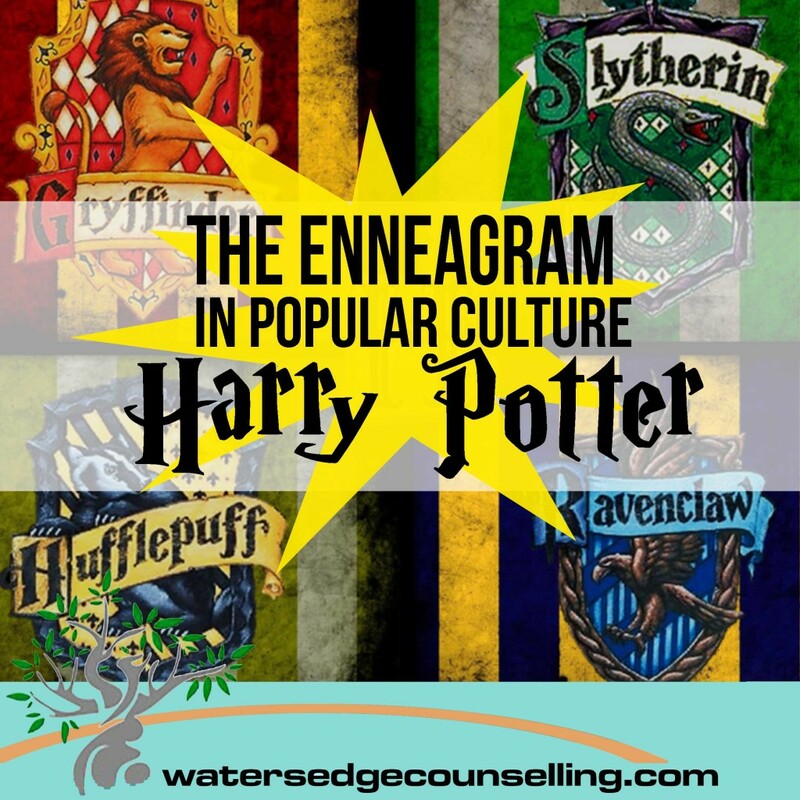 Starting with the characters of Harry Potter, we hope that our Enneagram in Popular Culture series makes the functions of the Enneagram easier to understand for you. So let’s take a look at the characters of Harry Potter and see what they can teach us about the differences within each type. Take a look at our infographic below, then scroll to the bottom of the page for our explanation of how these beloved characters display each personality type. Aptly sitting in Type 1, Harry Potter and Professor Dumbledore perfectly sum up the heroic traits of The Reformer. Both are driven by a pursuit of justice, believe in treating people with dignity and are willing to sacrifice themselves for the greater good. Charismatic leaders, they are at their best when they learn to accept the help and affection of the people around them. These characters struggle when they internalise their emotions and resist the help of others, thus becoming the ‘martyr’. The vastly different characters in Type 2 show us the differences that exist even within a single personality type. Dobby, Ginny Weasley and Professor McGonagall are all behind-the-scenes characters that will go to any length to help and heal their friends, yet they each show this in different ways. Dobby finds his purpose in the approval of others, so we see him driven to extreme lengths to help Harry, often to his own detriment. Ginny is happy to sit back and allow others to take the lead, yet can tap into her 1 wing when she needs to fight. McGonagall has a harsher edge to her Type 2 due to the drive that comes from her 3 wing. There really is no greater Achiever than Hermione Granger­­–unless you consider Percy Weasley of course! These two characters show us the healthy and unhealthy ends of the personality type. While Hermione starts off feeling isolated and pushing people away due to her own competence, we see her develop into a healthy Type 3 who allows her friends to soften her independence, complimenting them with her knowledge and determination. On the other hand, Percy chooses to stay in his unhealthy state, living with the belief that no one else can meet his extreme standards. Consequently he cuts off the people he loves the most. In fiction and in life, this type often holds the most variety in personality traits due to the unique nature of The Romantic. In Luna Lovegood we see a healthy Type 4. She is open and friendly, willing to hear the ideas of others and will accept them without changing her own values. Alternatively, Draco Malfoy is so uncomfortable in his own skin that he compensates with his façade of being a bully and manipulator. Voldermort is also an unhealthy 4, but instead of recognising his own vulnerabilities he has chosen to get completely immersed in his own reality. Falling into an unhealthy 3 wing, he is an underhanded and destructive leader who lives with his own sense of truth and idealism. Severus Snape is the quintessential Type 5. He hoards knowledge, isolating himself and meticulously observing everything around him. Driven by the loyalty of his 6 wing, he comes out of his shell only when he is shown understanding and love. Alternatively, Filch is perfectly comfortable in his cynicism and he chooses to remain closed to the affection of everyone (except his cat). He relishes in his difference and power, tapping into his 4 wing when he communicates with people. Type 6’s are the dark horses who often pop up unexpectedly with heroic acts. Both Neville Longbottom and Remus Lupin are driven by their loyalty to friends and the cause they believe in. Neville must overcome his own doubts, plucking up the courage to stand his own ground and truly embrace his own strength. Much older and more developed in his Type 6 idiosyncrasies, Lupin is more comfortable with his own abilities and convictions, using them to mentor Harry and his friends. Wild and unhinged are two words that describe Sirius Black and the Weasley twins well. Type 7’s are driven by the pursuit of the unknown. They want to explore, push the boundaries of what is expected of them and question authority. In Sirius we see this in the form of a darker, more tortured soul who chooses to be reckless. Alternatively, Fred and George Weasley are still quite young and naive, using their spirit to rebel against the status quo and make their friends laugh. Mad Eye Moody is a hero who sacrifices himself for the good of others and Professor Umbridge is a villain who inflicts pain on people. So what do they have uncommon? They are both motivated by their need to challenge what they believe is wrong. Mad Eye is abrasive and rough, never shying from a battle and adhering to his strict sense of what is right and wrong. Umbridge is also abrasive, but in a more subtle, passive-aggressive way. Completely stuck in her own warped morals, she relishes in the pain of others, bullying them in the belief that it will benefit the greater good. Both Ron Weasley and Hagrid try to keep their emotions at bay to avoid conflict. Ron reacts passive-aggressively when challenged because he hates the thought of confronting his own struggles, yet he is a loyal friend and uses humour to break tense situations. Hagrid responds to conflict by going into denial, shutting down and refusing to acknowledge the trouble in and around him. When these characters are healthy they are some of most sincere friends you could find. When they are unhealthy, they will act recklessly and you might as well be talking to a brick wall. Would you like to better understand yourself and the people around you? Do you want to learn more about the Enneagram? Here’s what you need to do: contact WatersedgeCounselling on 0434 337 245 for a FREE 10-minute phone consultation on how we can best help you, or press book now to book in our online diary.